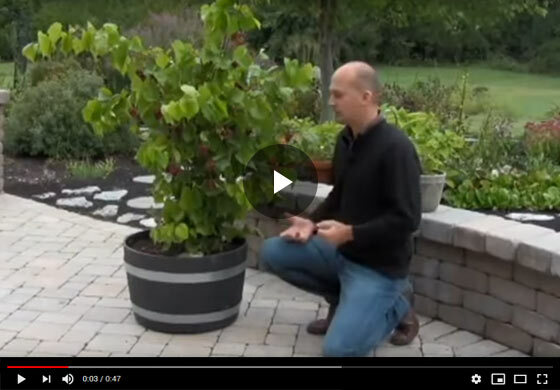 Join Felix from Gurney's as he shows off the new RazzMatazz grape growing in a patio area, discusses the grape's amazing virtues and growth culture. Hi everyone, Felix here at Gurney's and today I want to share with you our new RazzMatazz Grape in a patio setting and how you can use it there. This new grape does exceptional for a number of reasons, it's a muscadine regular table grape cross you have seedlessness and you have the wonderful muscadine flavor, and another trait that showed up here is that it's fruiting continuously along its shots so instead of just two or three clusters which you get with a normal table grape, you get up to twenty four clusters on your shoots here. So it continuously produces clusters along the shoot extension and as a result, in a patio setting, you get a lot more fruit on your grape structure...on your plant structure and you're going to enjoy more of it. And I hope you try this. If you are in the North, you can grow this even there by rolling it into your garage for the winter months and pulling it back out to your patio for the summer and it can even work for the northern zones. Muscadine grapes, these type of grapes are only hardy to minus 5 Fahrenheit, so, if you're north of that, your temperatures get below that in the winter, you're going to roll this into your garage but you can still enjoy it because you can put it in a pot. Thanks for joining us, I hope you try one of these grapes, they're extremely tasty, we love them and it's a completely new development where you have all this grape production along your shoot extension.